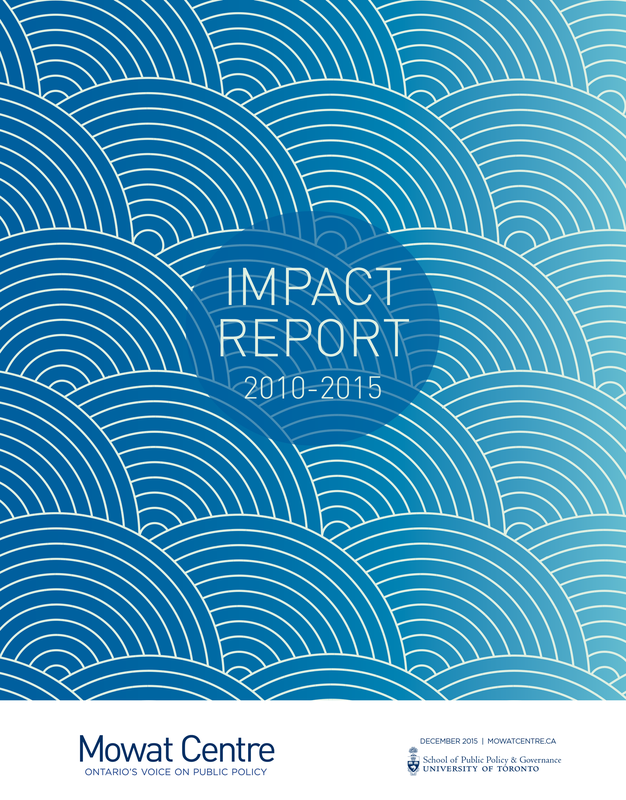 Mowat Centre’s Impact Report provides an overview of publications, activities and public policy impact from our first five years. In February 2015, the Mowat Centre marked its fifth anniversary. As we looked back on our first five years, we had a strong sense that Mowat has made a notable contribution — helping to create policy changes and influencing policy conversations on multiple issues of importance to Ontarians and Canadians. But as an evidence-based think tank, we challenged ourselves with this question: can we demonstrate our policy impact in a rigorous manner? How to quantify and report on impact is a significant challenge that faces all public policy think tanks. We had already identified tracking and reporting our impact as a strategic priority in 2013 and, as a result, we had already put in place a more rigorous system for tracking and analyzing our impact going forward. In the following pages we apply that analytical lens to the work of our first five years. Examining our impact quantitatively, this report analyzes our outcomes against performance measures derived from our 2014-2019 strategic plan. This strategic plan captured what had become our primary areas of research focus and expertise and articulated Mowat’s aspirational vision going forward. It guides us in strategically delivering on this vision and in measuring our success. We then present our impact methodology, which operationalizes these performance measures given available data. We aggregate our results per each calendar year from 2010 to 2014, as well as for the entire period, for those performance measures. We also highlight the Mowat reports that have performed the best on each of those performance measures. We follow our quantitative analysis with a more qualitative look at Mowat’s first five years. What are our successes in achieving policy change or influencing the policy conversation? Looking separately at each of Mowat’s focus areas, we provide an in-depth look at some major success stories and highlight other notable policy wins as well as instances of our work being used, cited or recommended in government and policy documents and in legislative proceedings and government consultations. Mowat’s direct policy impact successes attest to but don’t fully capture our thought leadership. As a thought leader, Mowat has had a less tangible impact in other areas beyond direct policy change: providing ahead-of-the-curve ideas that are eventually embraced by policymakers; persistently supporting positions that may not initially represent the common consensus, but become normalized over time; and in our work attaining enough staying power that policymakers, experts and the media continue turning back to it long after its release. In the final section of this report we look at Mowat’s success in each of these three areas. We end with a snapshot of the ever-growing network of experts, practitioners and stakeholders who have in various ways supported or collaborated in Mowat’s work.